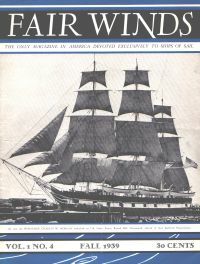 Fair Winds, the official publication of the Ship Model Society was published quarterly by W.M. Williamson. Our collection is incomplete. Claimed to be the only magazine in America devoted exclusively to ships of sail. The cover of the Fall 1939, Volume 1, No 4, shows the 100 year old whaleship Charles W. Morgan, at that time "enshrined on Col. Green Estate, Round Hill, Dartmouth, suburb of New Bedford, Massachussets. Much of this issue was devoted to fund raising to save the Morgan. We are actively endeavouring to complete this coolection, and may have some duplicates for exchange or possible sale. Please contact us for donations or exchanges.